The Order is unlocked when you reach 2050 points of prestige, through the quest in a new map “Hall of Greatness” reachable from Aelinar. 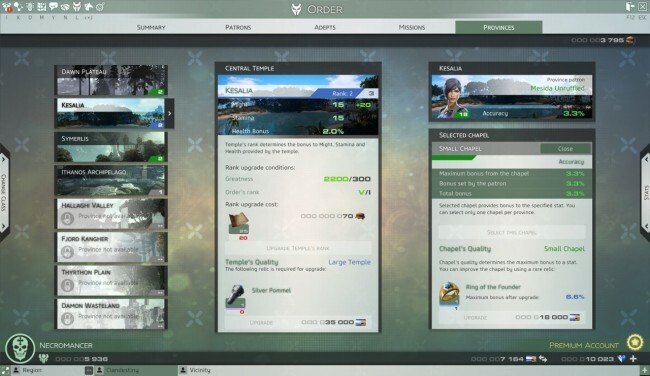 Once unlocked you’ll be able to access to your order through the key “L” or on the top left corner. As the name says here you have an overview of your order, in the first column you have the info about your building in provinces and their relative patrons, in the middle you see your Followers (which increase your order’s rank) and in the little box in the bottom are displayed the followers that wannna be your adept, while in the last column you see the information about your adepts and missions such as their number, their state, avaible missions and so on. 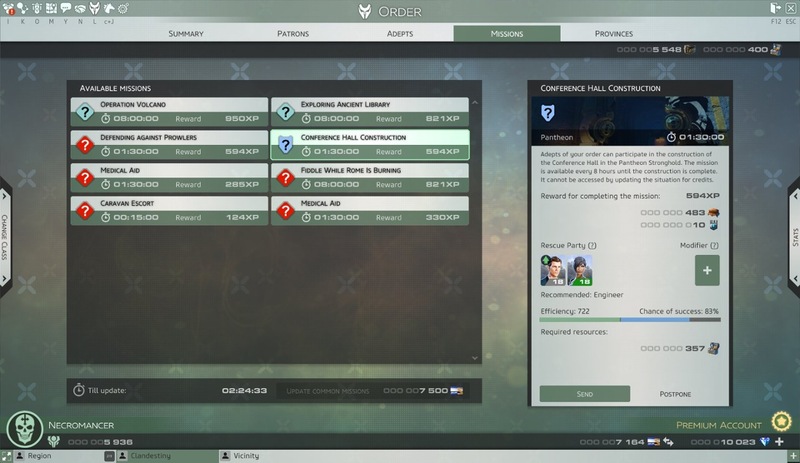 In this page you can assign an adept as patron on each structure you’ve built, you have to do it in order to benefit your building’s bonus, but note that if you wanna fully advantage the bonus of your building you must assign an adept with same or higher rank of your building following this order: Grey<Green<Blue<Purple like the color of item’s rarity. In this page you can see the adepts that you own, firstly you’ll have 8 slot for your adepts, that will increase reaching the rank signed in every locked slot. -Stats: here is the most important information that you have to care, every adept has two random ability with their own randomly assigned level that come from 1 to 5 and they are PERMANENT, while it is not the number under each ability, it will increase with the level and rank of your adept, obviously higher is the level of his ability higher it will be able to reach. Under the adept’s stats box you have the the possibility toenlighten or dismiss your selected adept. By enlightenment you can increase the rank of your adept using object you’ll able to obtain through quests/dungeons. With the “Make a missionary” button you will dismiss your adept in exchange of a little award. 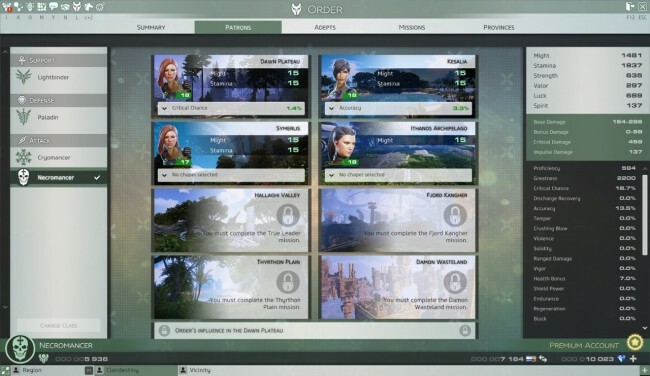 Here you have the list of avaible missions for your adepts at the left. -Blue shield with “?”: pantheon’s missions, will be unlocked as soon as a construction of a building in pantheon will be started, you will be rewarded with gift and contructions resources that will automacally go to the pantheon’s building. Also the mission’s duration will always follow 3 exact value: 0:15:00, 01:30:00, 08:00:00. 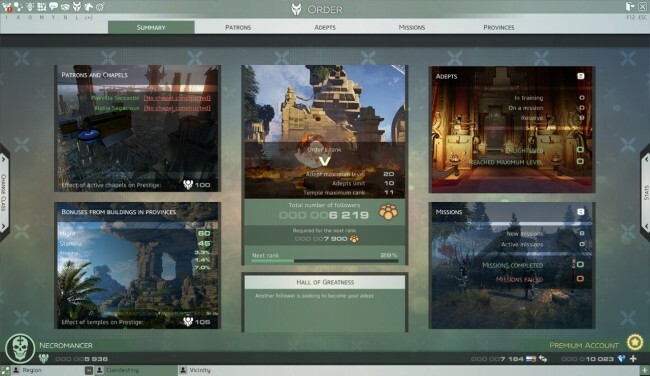 -required resource: currency that you need to send your adepts to do the missions(except the gathering one), there are only 2 types of resource, ammo and supplies, both obtainable through gathering missions or dungeon’s reward. Here is your provinces, at the beginning you’ll have only one province that will increase by completing special Hall of Greatness quests that you will receive improving your chacter’s prestige. As you can see in the middle column, every province has his own Rank and Quality. Rank: to upgrade it you need an item called Holy Text(obtainable by quests and dungeon’s reward) and Gifts(from adept’s missions), upgrading your province rank will only increase the value signed on the top. Quality: to upgrade it you need a special item obtainable only through dungeon’s reward(the dungeon will be randomly assigned every 2 days far the date of your last completion), it will let you to upgrade your chapels. 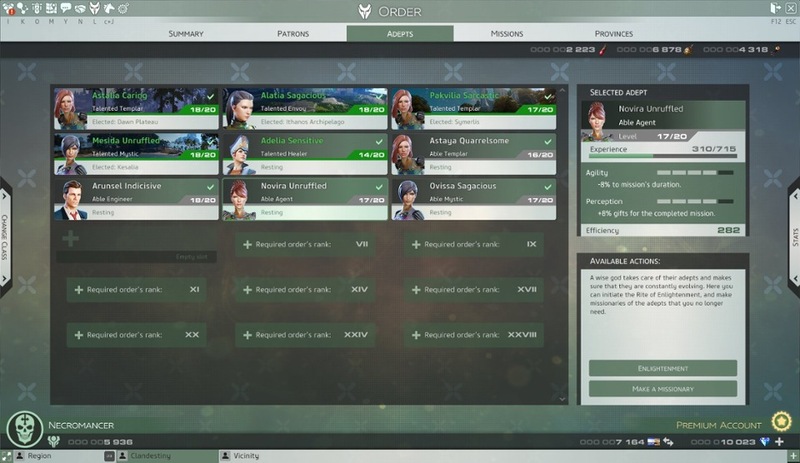 Chapels: every province has 6 different chapels that give usefull bonus for your main character such as accuracy or crushing blow, it can be upgraded to the same level of his province’s quality, using the same items needed to upgrade the quality of province. Also remember again that in order to benefit these bonus you need to assign an adept, as patron of the province, with the or higher rank. -Everyday you’ll have new followers that wanna join your order, and when you have them if there’s one better than one that you own, you should make a missionary your worse adept then hire and dismiss the new ones starting from the worse so you’ll end up with a new better adept and some followers obtained by dismissing the adepts that you don’t need. This process is usefull expecially for low rank as it help you to improve it also it don’t let you with a empty hole as other suggests. -The adept’s missions that recommend the engineer and agent are the most difficult, so is advisable to bring up more engineer and agent for the late, but of course you should train other classes too. -Is Highly recommended to enlighten only adepts with 8/10 or more ability level.